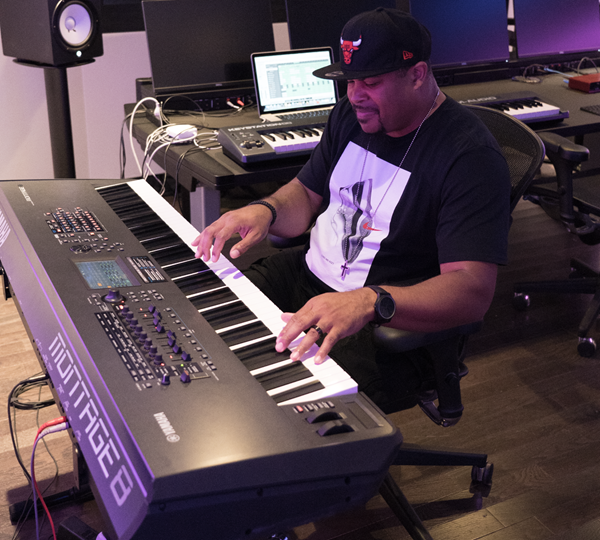 Yamaha Synthesizer Artist, Antoinio "Tone" Daniels is a multi-talented songwriter, producer, musical director, arranger and keyboard player. Antoinio "Tone" Daniels is one of the most sought after Musicians, Producers, Songwriters, Arrangers and Musical Directors in the music industry. His talents have been showcased both nationally and internationally. While traveling with a stage play in 1997, Tone was introduced to Grammy Award Winning/Multi-Platinum album selling R&B Mega star R.Kelly. Through working with R.Kelly, Tone was part of a production team that co-wrote songs and tracks on all of R.Kelly's albums and artists R.Kelly wrote for. . All of the albums and singles became RIAA Certified Multi-Platinum and Gold. Tone has worked with artists R.Kelly, Kelly Price, Carl Thomas, Latocha Scott (of Xscape) Britney Spears, Celine Dion, Israel Houghton&New Breed, Koryn Hawthorne, The Walls Group, Tasha Page-Lockhart, Jason Clayborn, Brandon Roberson and more. Tone is also a sought after Music Teacher/Educator, Conference Speaker, Music Workshop Instructor and Music Clinic Facilitator. He also serves as a teacher and mentor to younger musicians and producers. He is also currently developing his own lineup of artists on his Tone Soundz Music Media label imprint. Tone has also collaborated with some of the music industry's top level producers such as R.Kelly, NO ID, Kanye West, Percy Bady, Myke Snoddy, Justin Amundrud, Roy Hamilton III, Tony Russell, Jamel Kimbrough, Kendall Nesbitt, Gasner Allen, Jason Clayborn and more. Upon recently relocating to Nashville, Tennessee. Tone has also co-written songs with Grammy and Dove award nominated and winning christian and gospel songwriters such as Kenna West, Benji Cowart, Tony Wood, Jason Clayborn, Krissy Nordhoff, Daniel Doss, Justin Amundrud, Royce Lovett, etc. He recently just toured on the Summer Lights Tour as the Musical Director/Keys/Programmer for christian gospel artist Koryn Hawthorne alongside christian music's leading artists Matthew West, Leanna Crawford and Jeremy Camp. He is currently writing and recording his own project slated to release later in 2018. And is also currently collaborating with artists: Leanna Crawford, Acquanitta Skye, Adaeze and Carl Thomas, just to name a few. Tone has worked using the Motif XF, ES and XS series. He also works using the Montage 8, Montage 7 and the Yamaha C7 Grand Piano.